Alifelong dream that he’d dubbed his “masterpiece”, the rugged 2,189-mile Appalachian Trail (AT) was unchartered territory even for an accomplished ultrarunner of Scott Jurek’s pedigree. Dominating prestigious, elite trail and road events over two decades, Jurek has seven times reigned supreme in the Western States 100-Mile Endurance Run and is respected further for successes at Colorado’s Hardrock Hundred Mile Endurance Run, Death Valley’s Badwater 135 Ultramarathon and the 153-mile Spartathlon in Greece. But such an impressive CV could only prepare the American so far when entering the unforgiving Green Tunnel labyrinth. One of America’s most treasured National Scenic Trails, the Appalachian Trail covers almost the entire length of the United States: from Springer Mountain, Georgia, to the summit of Mount Katahdin in Maine. 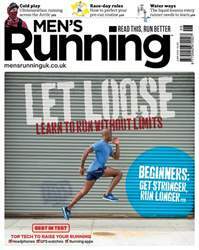 The June issue of Men’s Running is all about pushing your limits to become the best runner you can be. Whether that’s learning to love ultra-long distances—with the help of GB 24hr runner Robbie Britton—finding inspiration from the likes of hard-as-nails runners Damian Hall or Scott Jurek, or discovering what it takes to become a world champion, our strapline ‘read this, run better’ has rarely felt so apt. Elsewhere, you can find out whether four months of hard training paid off for our Big Marathon Challenge runners, heed some must-know hydration lessons, find out what it’s like to run an ultramarathon in the Arctic, and learn about the virtual running app attempting to transform the tedium of the treadmill. All that, plus our usual Best in Test kit reviews: this month, we turn our attention to the latest top tech for data-driven runners.